Neuroscientists from the University of Southampton will be exchanging their laboratories for the catwalk for a unique project to explain neuroscience through fashion. Over the last three years, the Changing Minds project has challenged second-year fashion design and knitwear students from the University’s Winchester School of Art to design garments inspired by research into conditions such as stroke, Alzheimer’s disease and schizophrenia. The unique clothes have already attracted attention at events and exhibitions and brought biological science to new audiences. 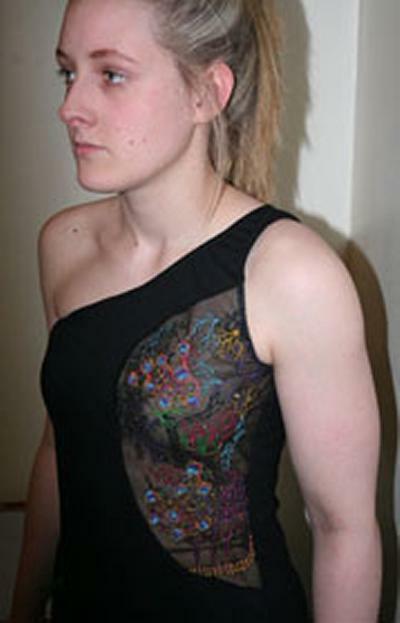 The dress on a theme of schizophrenia was designed by Nikki Day who researched the morphology of different classes of cortical neurons and then embroidered images to convey the emerging idea that this is a disease of aberrant connectivity. The classic histological drawings of Ramon Y Cajal also inspired her. “The dress is tight and slightly restricts movement to reflect the effect these brain cell malfunctions can have in limiting people with the disease in everyday life,” she says. The scientists will be showcasing their exciting collaboration with Winchester School of Art at the University tomorrow afternoon from 4.30pm, with presentations about neuroscience research at Southampton, the fashion show and a free talk from Professor Hugh Perry about ‘How common infectons affect the healthy and diseased brain’. Lindy Holden-Dye, Professor of Neuroscience at Southampton, started the collaboration with colleagues Dr Bina Nausheen and Dr Catherine Cowan in 2009 through the Biotechnology and Biological Sciences Research Council (BBSRC) Excellence with Impact scheme.